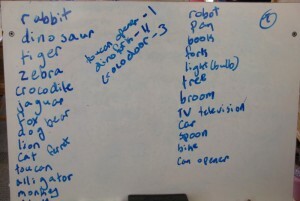 I do, last April for National Poetry Month I used it with my 3rd graders. Because April is such a short month for us, we didn’t get very far with it. I love Jack Prelutsky in general, and I decided to give this one a shot with my 1st graders this year (my 3rd graders are still reading Hugo Cabret, so we kind of skipped poetry month to make sure we finish by June). For some reason after beefing up my Prelutsky collection this year I neglected to get Scranimals, which would have been a great companion with this. Next year. Anyway, do you ever go back and reread some of your blog posts and just find yourself mortified at how mediocre they are? I’ve been having that feeling a lot lately as I go back and look at my school posts from last year. Maybe it’s not the posts so much as the lesson plans. At the time I was excited about everything I was doing, but I guess each year as I learn more and do more exciting projects I’ll always think what came before was kind of boring. Or that I didn’t take it far enough. Hey, it’s only my 2nd year teaching and my 3rd as a librarian. I should cut myself some slack, right? But I digress. 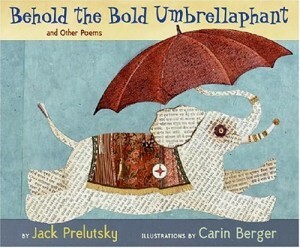 This month with the 1st graders we read the poems from Behold the Bold Umbrellaphant. Then together we brainstormed lists of animals and household objects to try and come up with our own new animals like the ones fabulously illustrated by Carin Berger. Once we came up with some animal mashup ideas, we voted. 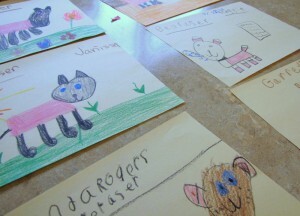 Then we took the winning animal and made illustrations of it, however each child thought it should look. I’d wanted to do full-on collages for this inspired by Ms. Berger’s illustrations, but a) we were a little collaged-out after our House in the Night projects (still picking up bits of yellow paper everywhere, next year I’ll space these out better), b) because of the schedule this month I was only able to even get this far with 2 of the 4 first grade classes, and c) I’d definitely have to hang up the masterpieces in our library gallery, and I feel like the 1st graders have dominated that gallery this year. I don’t know what it is, I’ve just been on a roll with them. I mean, come on. 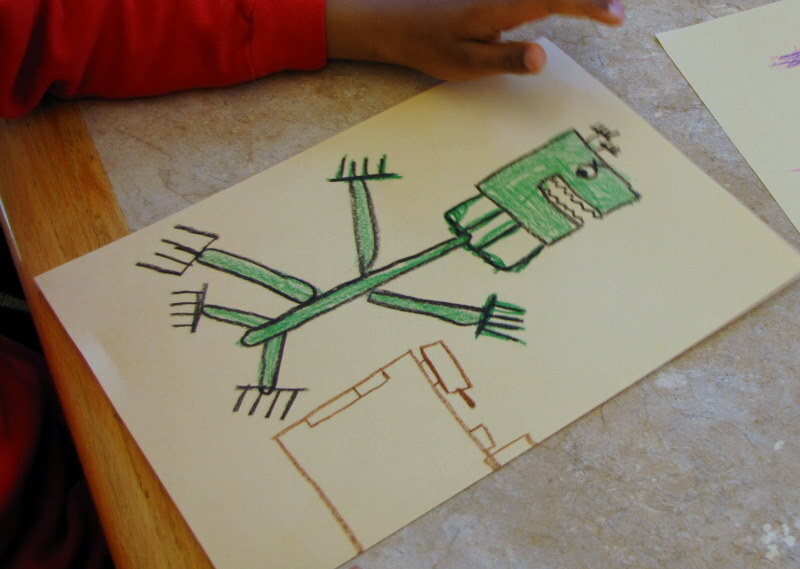 Doesn’t Jordan’s illustration of a Dinofork look exactly, perfectly, like a Dinofork should? Now I can’t imagine one any other way.